The works in this recording shed valuable light on Reger's aesthetic position. Based on a well-known poem entitled "Requiem" by the great German dramatist Friedrich Hebbel Reger's so-called Hebbel-Requiem makes an almost classical impression although it is far from classical in conception. The dominant mood is one of a nation's simple grief; the work is dedicated to "the memory of the German heroes falling in the Great War". Reger had already used Hebbel's poem once before in a setting for unaccompanied choir. His "War Requiem" makes it into an apotheosis of death and eternal life. Emotive elements are not lacking but a restrained dignity predominates, as in the impressive final section where the Lutheran funeral hymn "Wenn ich einmal soll scheiden" enters the polyphonic structure. Fritz Stein, Reger's friend and biographer, mounted the first performance of the opening movement of Reger's Latin Reuqiem op. 145a in Berlin in 1938: it is given this name to distinguish it from the so-called "Hebbel-Requiem" op. 144b. The second movement, now presented on this CD, a fragmentary Dies Irae, was not performed in 1938. 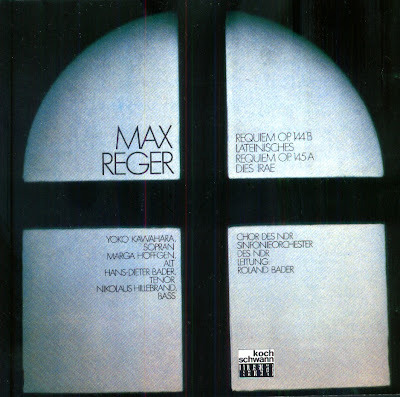 Reger who was working on the composition with real enthusiasm suddenly abandoned the project and never took it up again. It has been suggested that when Straube saw the score of the first movement on its way to the printer's, he advised Reger not to go on with it. This prompts one to wonder what Straube's attitude to Reger was ? It must have been basically constructive because after all he was the chief interpreter of Reger's important organ music. Reger for his part was far too productive to cling to a project once one of his trusted advisers had warned him off it. The surviving fragments of the work suggest that it would probably have been one of the last liturgical requiems in the nineteeth-century sense of the word. Reger was working in terms of broad expanses of tonal colour without polyphonic complexities: he contrasts his solo quartet with the main choir in an almost responsorial way, provides his orchestra with almost every conceivable type of instrumental accompaniment, and goes all out for the musical effects which the wording of the text inspires. Intensely contemplative supplication swells to despairing entreaty, then ebbs away with the despairing insight that man is ultimately powerless. The Dies Irae then unlocks the flood-gates of terror to evoke visions of horror and nightmare akin, though perhaps unconsciously on the composer's part, to both James Ensor and Hieronymus Bosch. The Compact Disc was released by Koch Schwann, 1988, (DDD). Koch Schwann 313004 H1.